Add live chat widgets to your website pages so your visitors can quickly start a conversation with you and your team. Learn how to set up your live chat profile, customize your chat availability, and respond to your visitors in the conversations inbox. In the left sidebar menu, navigate to Conversations > My profile. To change your avatar, hover over the image, then click Change photo. To edit your name, click the pencil icon edit to the right of your name. To select which meetings link appears in your chat profile, click to toggle the Show meetings link switch on/off. Click the Choose meetings link dropdown menu and select your preferred meeting link. Enter the text that you want to appear with your meetings link into the Meetings link text field. 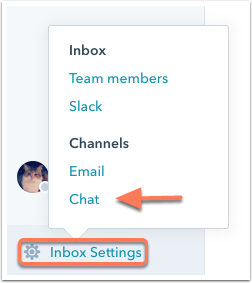 Once you have set up your live chat, you can edit your team's availability, chat widget appearance, and add the widget to your website. In the lower-left corner, click Inbox Settings, then select Chat. On the Customize tab, edit your live chat's appearance. Select an accent color for your live chat's display. 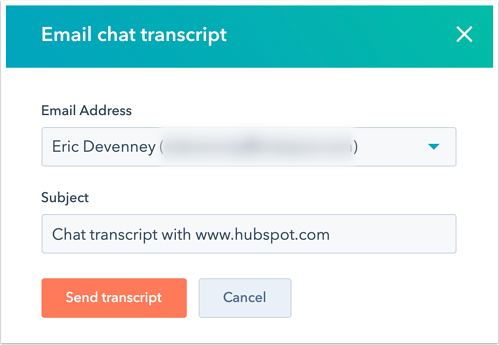 If you want to include HubSpot's own branding on your chat window, click to toggle the Show HubSpot branding on your messages chat window switch on. Click Save, then click the Availability tab. During business hours: click + Add hours to add more days and time ranges. Click the Show typical reply time dropdown menu to let visitors know when they can expect a reply. Then click the If all team members are 'away' or at capacity, then dropdown menu and select an away mode widget behavior. 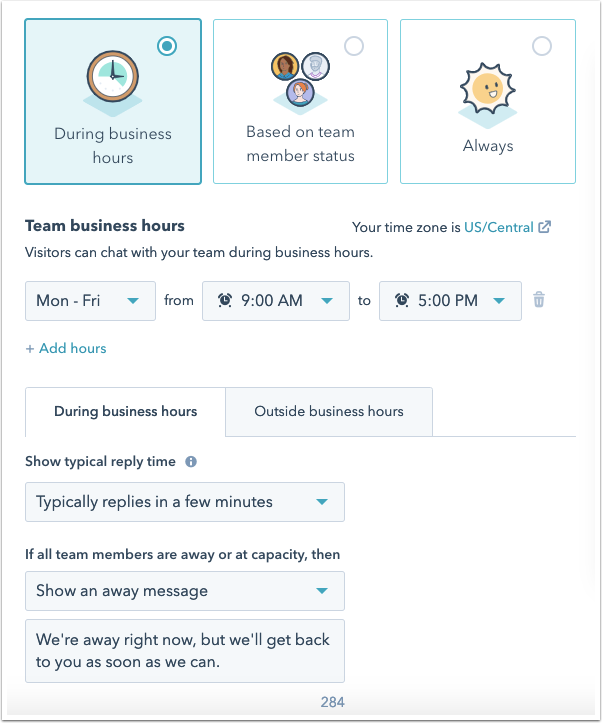 Outside business hours: click the dropdown menu and choose to either show an away message, show a reply time, or hide the chat launcher when a visitor comes to your site outside of business hours. Based on team member status: visitors can chat with your team if at least one team member from the live chat routing rules is available. Available: click the Show typical reply time dropdown menu to set a reply time. Away: enter your away message text. Or click the dropdown menu and select Hide chat launcher so the widget does not display if no one is available to chat. Always: your team always appears available to chat. Use the Show typical reply time dropdown menu to let visitors know when they can expect a reply. If you don't wish to show visitors this information, select Don't show a reply time. Please note: if a bot is associated to a live chat, it will override the chat's availability settings. As a result, the chat widget will always appear. This means the bot can hand off a conversation to a user outside of business hours if the individual user is still set to Available. Therefore, enable Away mode outside of office hours so a bot does not hand off a conversation to you. Click Save, then click the Options tab. By default, after you close each chat, a copy of the chat transcript will be sent automatically to the visitor. If you don't want to automatically send the transcript, click to toggle the Automatically send a chat transcript at the end of a chat switch off. If you do want to automatically send the transcript, click the From address dropdown menu and select which email address the transcript should be sent from. You can only send chat transcripts from a shared connected inbox. Click Save, then click the Tracking code tab. If you're adding the chat widget to an external website, click Copy, then add the code right before the </body> tag on every page you want the chat widget to appear. Or, you can send this code directly to your web developer. Please note: websites built with Wix do not support conversations, so you will not be able to include the chat widget on your Wix site. In order to add a chat widget to your WordPress site, first install the Contact Form Builder for WordPress - Conversion Tools plugin. Learn more about how to install the plugin on your WordPress site. You can compose your chat response using the text editor in the conversations inbox. The contact record is available in the right sidebar for full context throughout your conversation. In the left sidebar, click a chat conversation . If you want to assign the conversation to a new owner, or take over a bot conversation, click the Assignee dropdown menu in the top-left corner. Type your response into the text editor at the bottom of the conversation. Use the link iconlink to share a link with your contact. Use the paper clip icon attach to share an attachment from your device or your file manager with your contact. Documents: attach a piece of content to your chat. Snippets: quickly add short, reusable text blocks into your chats. Meetings: add a meeting link to your chat. Knowledge Articles: add a knowledge base article to your chat conversation. Quotes: share a quote in your chat. Video: share a video via chat. When you're ready to send each response, click Send. Once your chat is closed, click success Marked as closed. The user ends the chat from the inbox by clicking success Marked as closed. The visitor is inactive for a period of time. The visitor is chatting with an automated bot, and the Collect user input checkbox is not selected in the bot's settings. With this setting disabled, the visitor cannot continue chatting with the bot. When a conversation ends, the visitor can initiate a new conversation by clicking Start new chat. In your inbox, select a closed chat conversation. In the closed chat window, click the More dropdown menu, then select Email chat transcript. Click the Email address dropdown menu and select a contact's email address. In the Subject field, edit the subject line text. The transcript will be sent directly to the visitor's inbox, including a timestamp of your conversation and a link to the website where the chat originated. 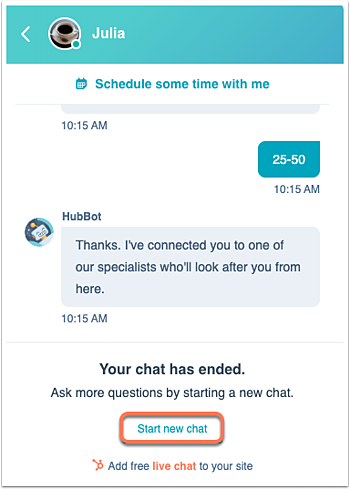 Please note: HubSpot does not currently have the Email chat transcript option for chat conversations started by bots. The chat widget can open automatically when website visitors load a specific page URL. 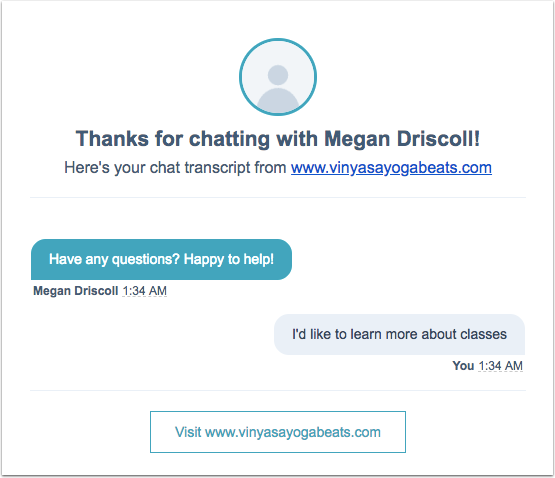 You can link these URLs in your emails, landing pages, and other marketing campaigns to send visitors directly to your chat widget so they can contact one of your team members immediately. Append #hs-chat-open to the end of your URL to trigger the chat widget launch. For example, link a CTA in a marketing email to www.yourcompany.com/pricing/#hs-chat-open. 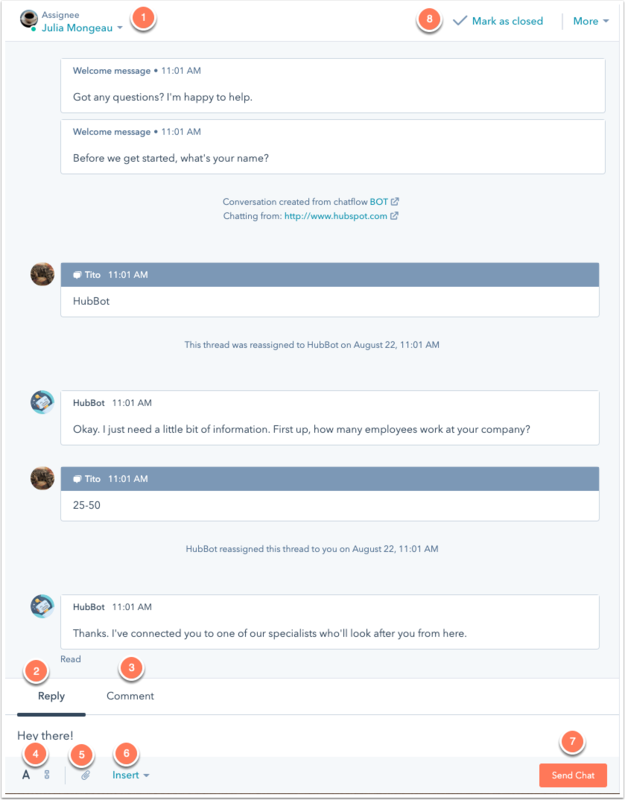 The chat widget will open immediately and your visitor can start chatting with a member of your sales team as soon as the page loads.